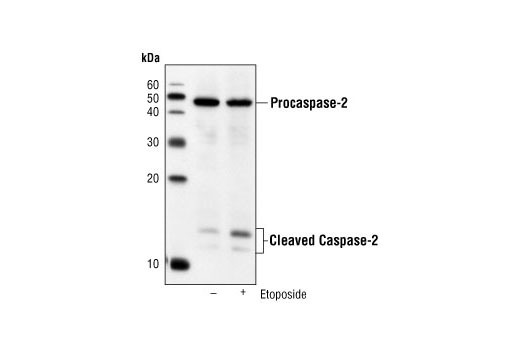 Western blot analysis of extracts from Jurkat cells, untreated or etoposide-treated (5 hr, 25μM), using Caspase-2 (C2) Mouse mAb. Caspase-2 (C2) Mouse mAb detects endogenous levels of procaspase-2 as well as its 14 and 12 kDa cleaved fragments. Monoclonal antibody is produced by immunizing animals with a synthetic peptide corresponding to the carboxy-terminal portion of human caspase-2. Caspase-2 (Nedd2/ICH-1) is a Class I caspase with a long prodomain necessary for nuclear localization. Upon activation of the apoptotic pathway, the procaspase is cleaved at Asp316, producing a 14 kDa fragment and a 32 kDa prodomain/large subunit. Subsequent processing at Asp152 and Asp330 produces an 18 kDa large subunit and a 12 kDa small fragment (1). Caspase-2 is the nuclear apoptotic respondent to cellular genotoxic stress or mitotic catastrophe. Activation occurs upon recruitment to a complex containing a p53-induced death domain protein, PIDD (2). This suggests caspase-2 can be a nuclear initiator caspase with a requirement for caspase-9 and caspase-3 activation in downstream apoptotic events (3, 4). In apoptotic pathways resulting from UV-induced DNA damage, processing of caspase-2 occurs downstream of mitochondrial dysfunction and of caspase-9 and caspase-3 activation, extending a possible role for caspase-2 as a parallel effector caspase (5). Li, H. et al. (1997) J Biol Chem 272, 21010-7. Tinel, A. and Tschopp, J. (2004) Science 304, 843-6. Dirsch, V. M. et al. (2004) Oncogene 23, 1586-1593. Castedo, M. et al. (2004) Oncogene 23, 4362-70. Paroni, G. et al. (2001) J Biol Chem 276, 21907-15.